The Root River Field to Stream Partnership (RRFSP) is a unique water monitoring project located in southeast Minnesota. This partnership combines rigorous data collection, strong personal relationships, and real conservation action. The RRFSP project uses both edge-of-field and in-stream monitoring to characterize water quality in three study areas within the Root River watershed. Through outreach activities and one-on-one meetings the results are discussed with farmers, landowners, fertilizer dealers, water managers and community leaders to promote an advanced level of conservation planning and delivery. The lessons learned from the first seven years of monitoring and the stories of three farmers are shared in the following video released in 2018. 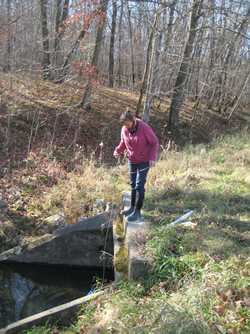 The purpose of this project is to conduct intensive surface and groundwater monitoring at multiple scales in order to provide an assessment of the amount and sources of nutrients and sediment delivered to the watershed outlet and also to determine the effectiveness of agricultural conservation practices. Phase II: Starting in 2016 farmers were offered a unique field walk-over opportunity to help locate the high risk areas of their land. Best Management Practices (BMPs) are now being implemented throughout the study area to address these high priority areas. Monitoring will continue for the next several years to detect water quality changes over time. A total of 90 grass waterways spanning over 65,000 linear feet have been installed in high priority areas. Thirteen new water and sediment control basins and catchment ponds were installed in targeted locations. Rehabilitation of a 1950’s era flood control structure, which is estimated to store on average 170 tons of soil, 1,380 pounds of nitrogen, and 350 pounds of phosphorus annually. This project has extended the trapping benefits for an additional 30-50 years. Nearly 200 acres of cover crops have been planted by farmers in the project watersheds. 74 acres of conservation reserve program (CRP) pollinator habitat (CP42) were seeded on a highly erodible field. Feedlot improvements include increase in manure storage, moving milk house wastewater systems, and abandonment of a feedlot in a high risk location. 5,000 linear feet of new or renovated waterways and 13 water and sediment control basins were installed. The Root River Watershed is located in southeastern Minnesota. It is approximately 1 million acres in size and encompasses diverse landscape features. At least one edge-of-field and one in-stream monitoring station is located in each of the three distinct geologic landscapes of the Root River watershed. Out of over 60 sub-watersheds in the Root River Watershed, three were selected for this study. 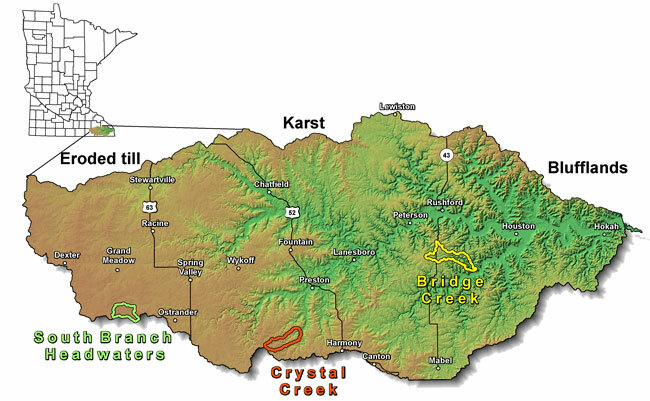 The three subwatersheds are South Branch of the Root River Headwaters, Crystal Creek, and Bridge Creek. In-stream monitoring sites are located at each of these subwatershed outlets. Each site captures water from an area of 2,800-4,700 acres. In-stream sites are equipped to continuously monitor stream flow, turbidity and precipitation during ice-free periods. Samples are collected by staff from Fillmore and Mower County Soil and Water Conservation Districts. In-stream samples are used to establish baseline data and determine the long-term (more than 10 years) effects of land management activities employed as part of the project. Edge-of-field sites provide information about the amount of soil and nutrients moving off a given field into an adjacent waterway. In addition to measuring surface water runoff, equipment has been installed at one station to also measure sub-surface tile drainage. Each site captures water from an area of between 18 and 96 acres. Four edge-of-field sites have been installed. The monitoring equipment is located at the edge of actual working farms. Each site is fully automated to collect water samples whenever runoff occurs as well as to continuously collect data on soil temperature and moisture, precipitation and ambient weather conditions. Water samples are analyzed for nitrogen, phosphorus and sediment. In addition, water moving through the soil and below the root zone of growing crops is monitored for nitrate-nitrogen using lysimeters. Monitoring occurs 365 days per year. Field 1: Headwaters Watershed. Con and soybean rotation with sub-surface tile drainage (no manure), 2% slopes. 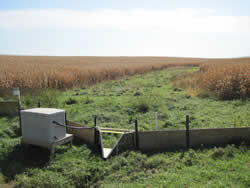 Both surface and sub-surface runoff is monitored at this field. Field 2: Crystal Creek Watershed. Continuous corn with alfalfa rotated every 4-5 years. Liquid injected dairy manure, 8% slopes. Field 3: Crystal Creek Watershed. Contour strip cropping with two-thirds corn and soybeans and one-third alfalfa. Injected liquid hog manure applied to soybean acres, 6% slopes. Sediment fingerprinting to track sources of watershed sediment, a sediment budget for the Root River. Together these tools and techniques help to characterize water quality and hydrology and represent a comprehensive scientific approach to understanding an entire watershed. The Root River Field to Stream Partnership is funded by the Minnesota Clean Water Land and Legacy Amendment.